Elizabeth A. Greno Financial Advisor Buffalo, NY Elizabeth A. Greno – Trubee, Collins & Co., Inc.
Elizabeth A. Greno came to Trubee, Collins & Co., Inc. with more than 23 years of experience in the financial services industry. 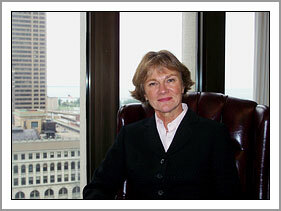 Betsy began her career with M&T Bank after graduating from The College of Wooster in 1978. She moved her financial consulting practice from O’Keefe Shaw & Co., Inc. to Trubee, Collins in 2009. Betsy holds the General Securities Series 7 and Uniform Investment Advisor Series 65 as well as Life, Health and Variable Annuities licenses. She attained her Accredited Asset Management SpecialistSM or AAMS® designation in 2002. Betsy believes a good investment program has well-defined goals and is consistent with each client’s risk tolerance. After a comprehensive analysis of her client’s financial situation, she will recommend a suitable investment program and monitor it on an ongoing basis. Betsy and her husband, Jim, reside in Williamsville where they are active members of Calvary Episcopal Church. Betsy is active with the Family Justice Center, and a member of the Financial Planning Counselors of Western New York.